I have a confession to make. I have never baked donuts before. Plus, this is only the second time in my life I’ve ever made homemade donuts. The first time was over 40 years ago just out of high school and that was deep frying the donuts. It was so much work I’ve never wanted to repeat the process. Hey, why should I when I can just go to the store and purchase great tasting donuts without all the work? 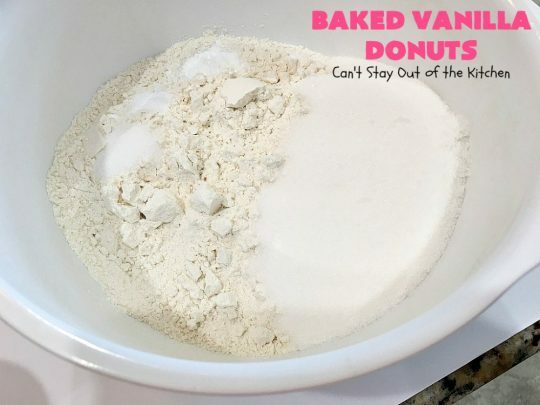 My mom used to make homemade donuts for us growing up. I think that’s why I’ve always loved donuts–especially the ones with plenty of icing and sprinkles. 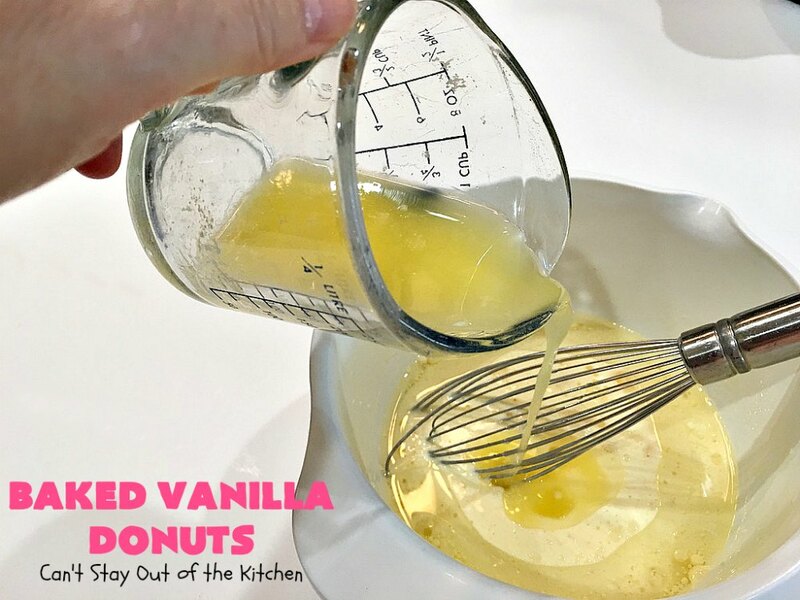 But those were fried and even though delicious, they had a lot more calories than I wanted to add for this donut recipe. I’ve had this blog for six and a half years now. 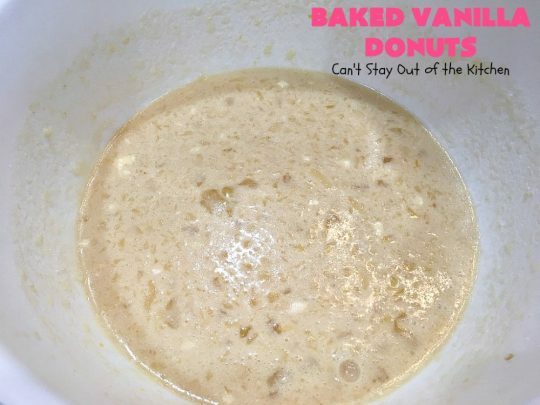 I’ve been wanting to make donuts practically that whole period, but I’ve always chickened out. 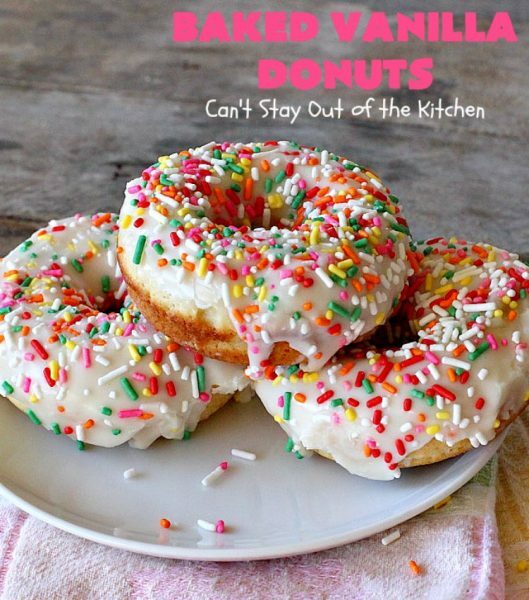 I even bought a couple of donut pans on deep discount clearance over five years ago. Those pans stayed in my pantry that whole time without being used. 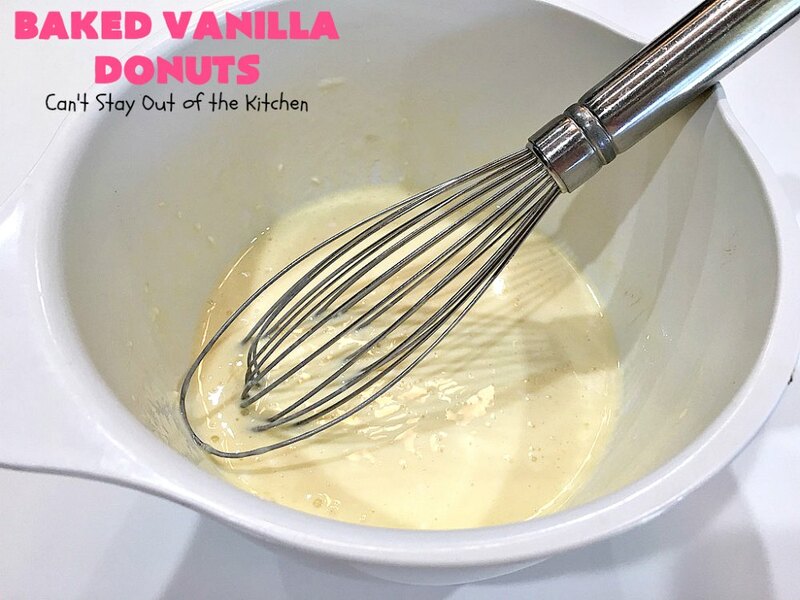 Finally, I decided it was time to motivate myself and give homemade donuts another try. 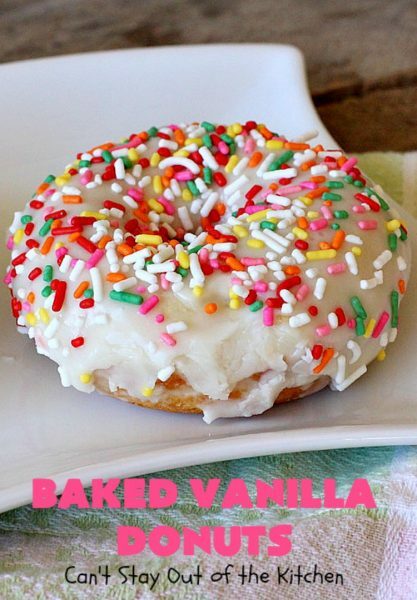 First of all, I wanted baked donuts–not fried. I started combing through Pinterest recipes looking for some that might be simple enough for a beginning donut maker. I found a couple that I wanted to try out. One was chocolate and this one was vanilla. I followed this particular recipe fairly closely, except I scrapped the nutmeg entirely. I enjoy nutmeg and would have loved it. However, I was making these donuts for a group of teenage girls at our church for a weekend youth function. I didn’t think they’d eat donuts with nutmeg in them. 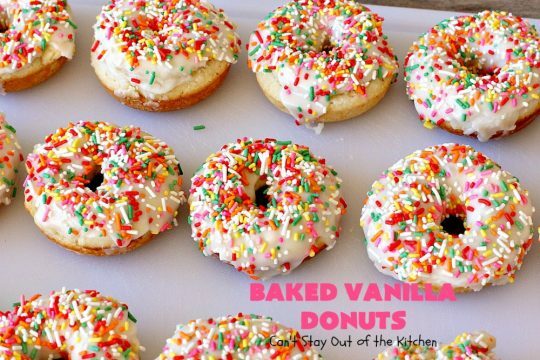 I also glazed the donuts three times before adding the sprinkles on top. Granted, my donuts probably aren’t as pretty or as perfect as some you will find on other food blogs. But I was so proud of myself for finally digging my heels in and making them. 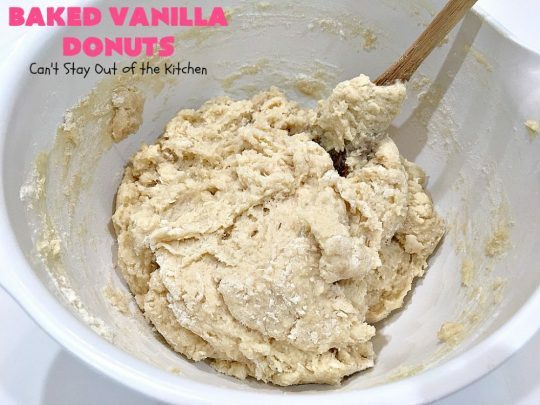 While donuts can be a lot of work, these really were a lot of fun. I know my grandchildren will love making these with me when they come down to visit next month. So, if you’re ready to give donuts a go, give these marvelous Baked Vanilla Donuts a try. I baked them a day in advance and thought they were still fresh enough to serve. I got rave reviews from those who ate them. 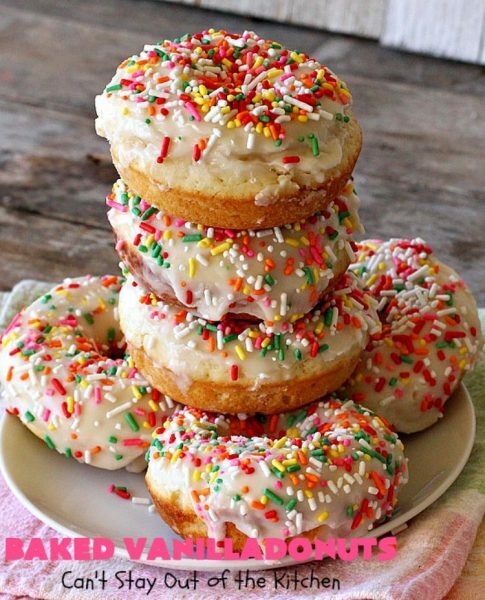 What’s not to love about donuts with lots of icing and sprinkles? I think it’s my favorite comfort food. Really. Baked Vanilla Donuts are awesome! Seriously, your friends and family will love these donuts for Thanksgiving, Christmas or New Year’s breakfast. 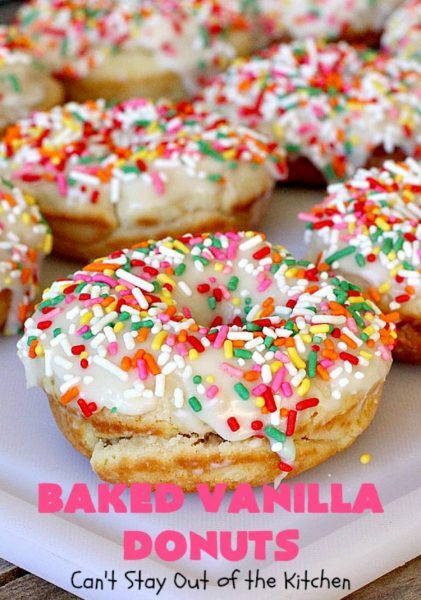 Every bite of these donuts will have you drooling. I could have eaten ALL of the Baked Vanilla Donuts by myself! Place flour in a mixing bowl. Add baking soda, baking powder, salt and sugar. In another bowl, combine eggs, sour cream and milk. Add melted butter, vanilla and canola oil. Add liquid mixture to flour mixture in mixing bowl. Stir to combine, being careful not to overmix the dough. Batter will be thick. 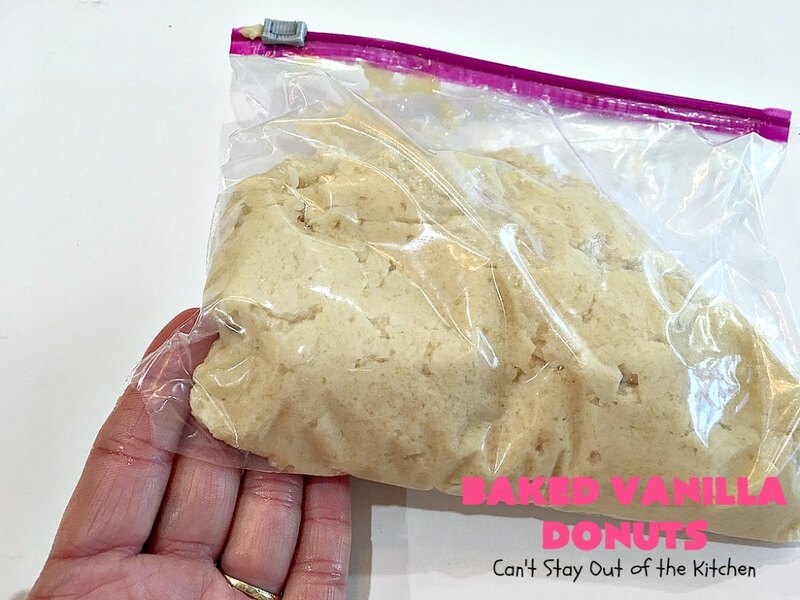 Spoon the donut dough into a zip lock bag. Cut off a large corner on one end. Spray donut cavities extremely well with cooking spray. 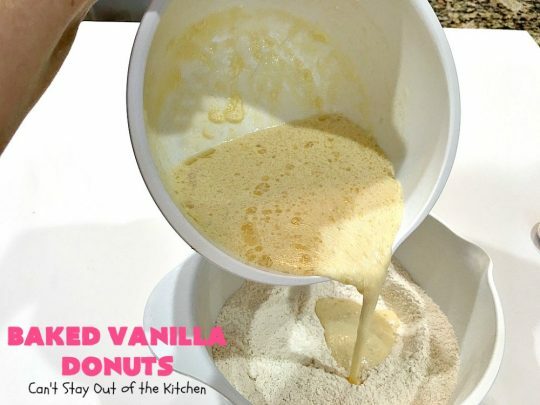 Pipe donut dough into each cavity and fill almost full. 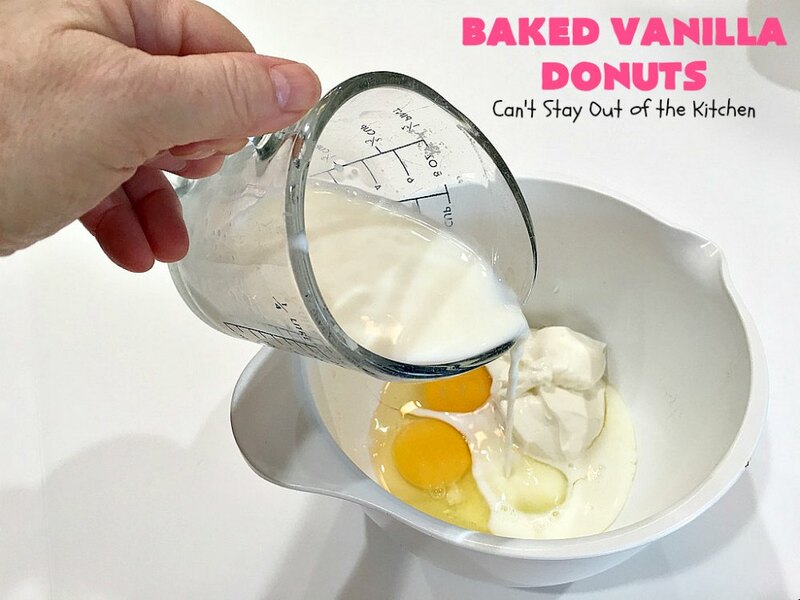 (Since this makes 15 donuts you will need to reuse one of the pans after donuts have cooled)….unless, of course, you have 3 or 4 donut pans! Bake at 425 about 10 minutes or until donuts test done. Edges will be lightly browned and a toothpick inserted in center will come out clean. Allow donuts to cool in pan about 2 minutes before removing to wire racks. 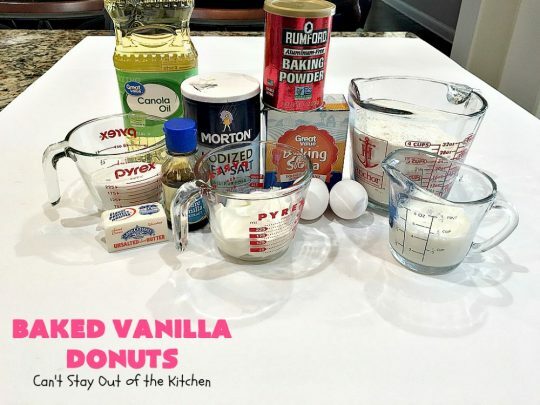 (Spray donut tray with cooking spray and repeat for remaining 3 donuts). I used these ingredients to make the vanilla icing. 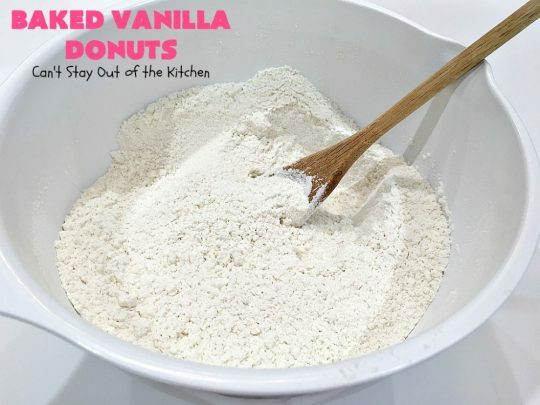 Combine milk, vanilla and powdered sugar with a whisk until smooth. 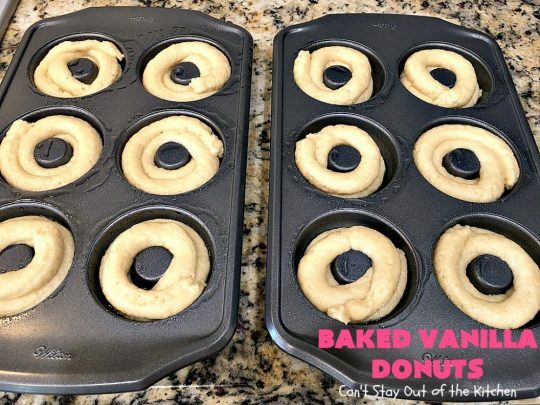 Dip donuts the first time in glaze, then place on cookie racks. Allow icing to set about 2 minutes before dipping in icing again. Place on wire rack again. 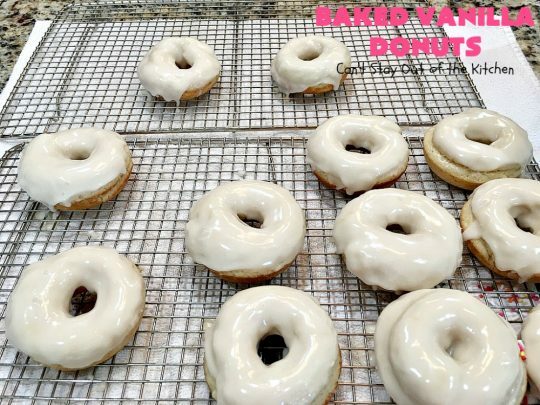 For each donut, dip in glaze one final time. Immediately sprinkle the sprinkles over top of the glaze and set on cookie rack, platter or cookie sheet. 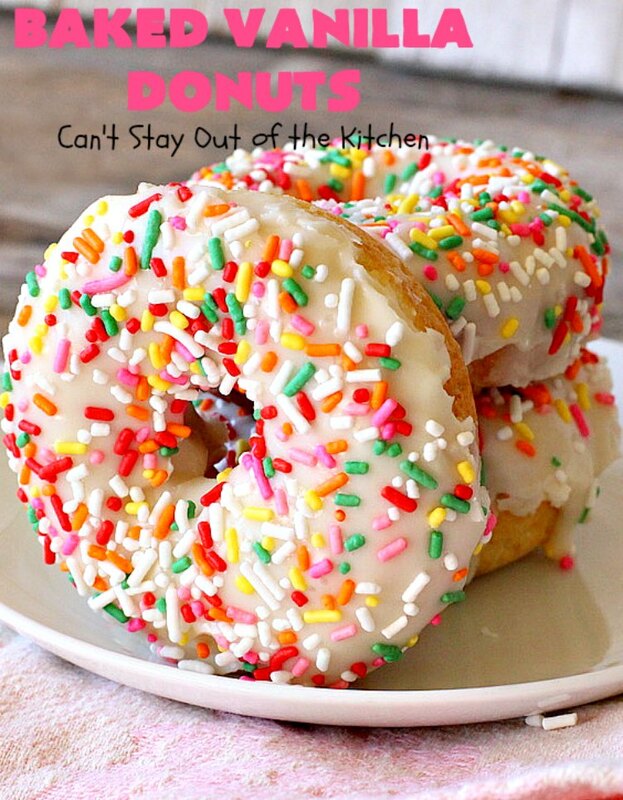 Repeat with each remaining donuts. 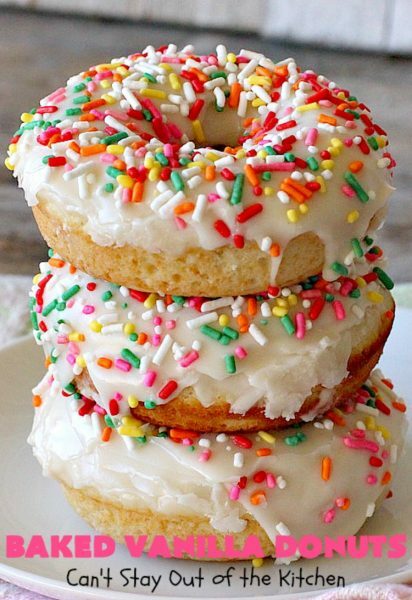 Allow icing to set up on donuts a minimum of ten minutes before serving. I used two to three tablespoonfuls of sprinkles on each donut! 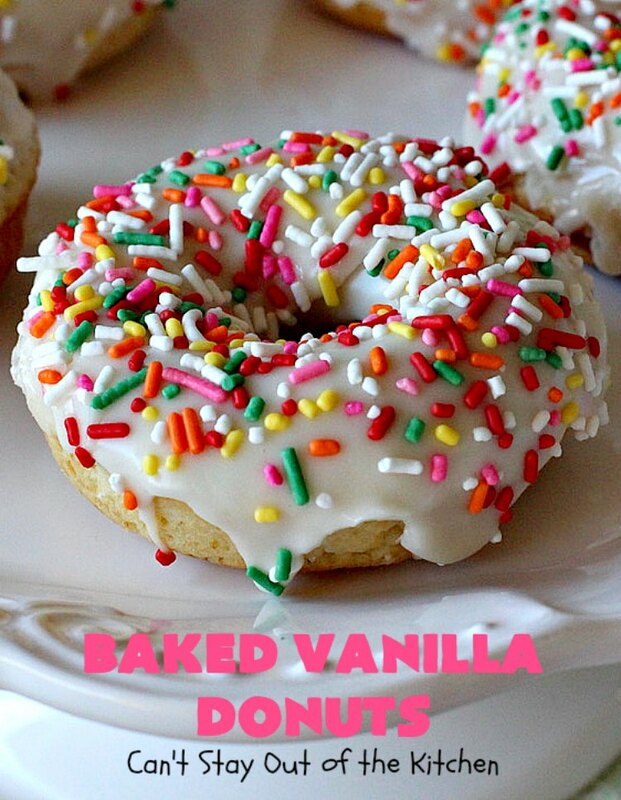 Baked Vanilla Donuts are perfect for holiday or birthday breakfasts. These luscious donuts are divine! These fantastic vanilla donuts are the perfect addition to any holiday or birthday menu. 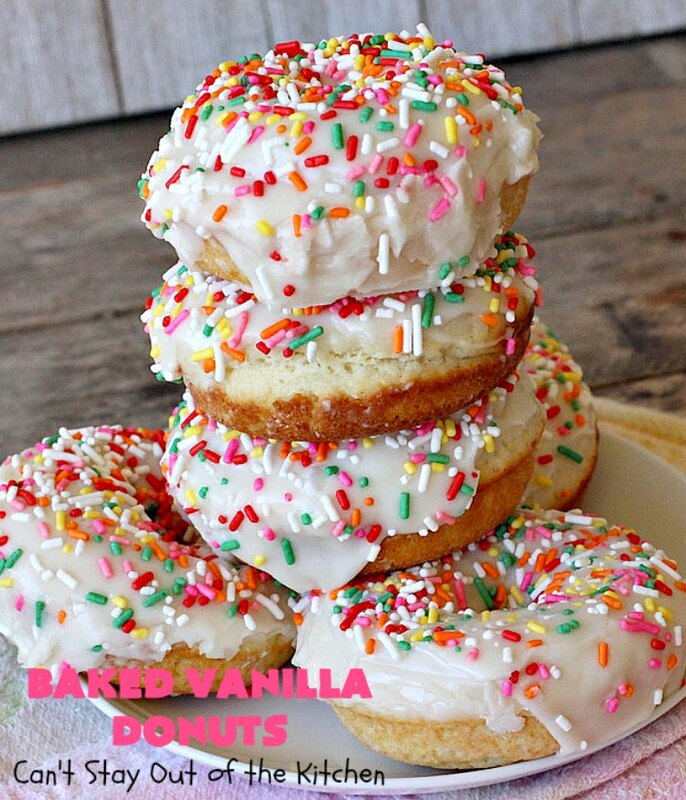 The donuts are glazed three times in a vanilla icing before being smothered in sprinkles! 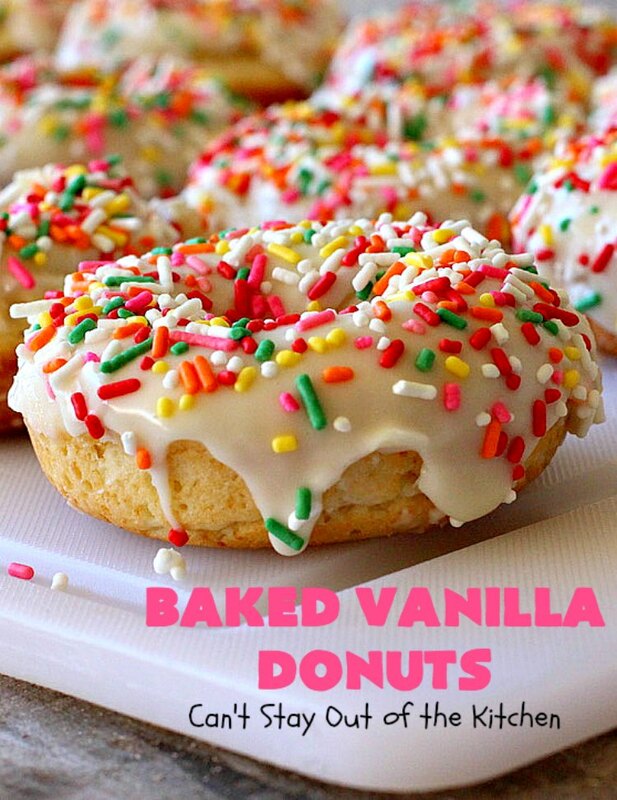 These luscious donuts are sure to have you drooling after the first bite. Whisk in melted butter, canola oil, and 2 teaspoons vanilla extract. Pour the butter mixture into the flour mixture and stir just until combined. Place donuts on rack for about 2 minutes before dipping in glaze again. 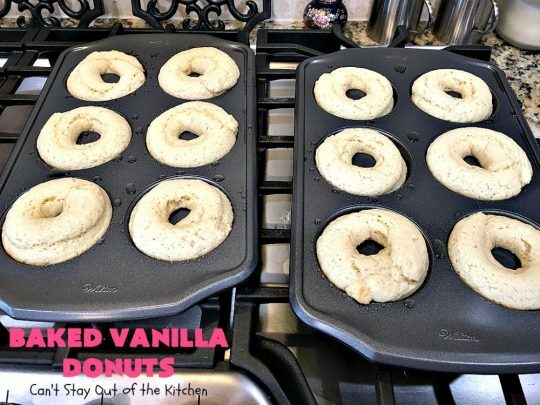 Finally, dip donuts in glaze a third time. 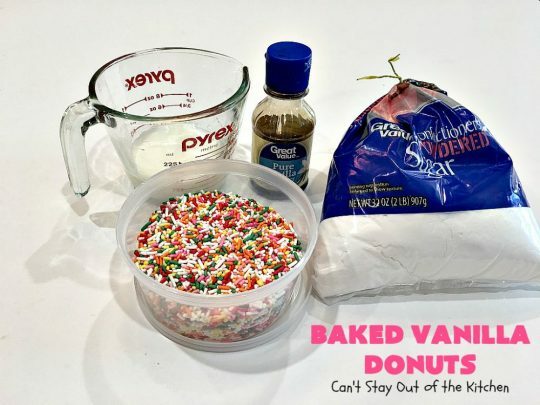 Immediately sprinkle donuts with colored sprinkles before glazing the next donut. 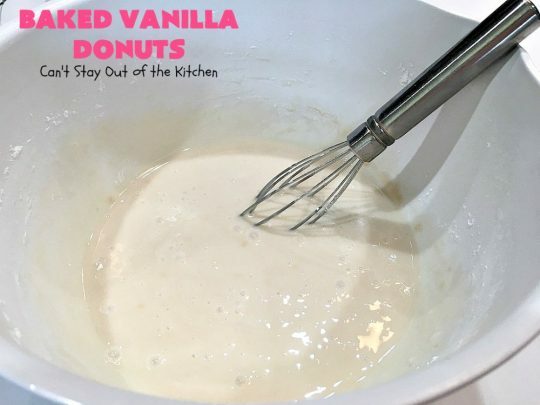 In a medium sized mixing bowl, whisk milk, powdered sugar and vanilla extract until smooth. Wait about 2-3 minutes and glaze again. Repeat again after 2-3 minutes. 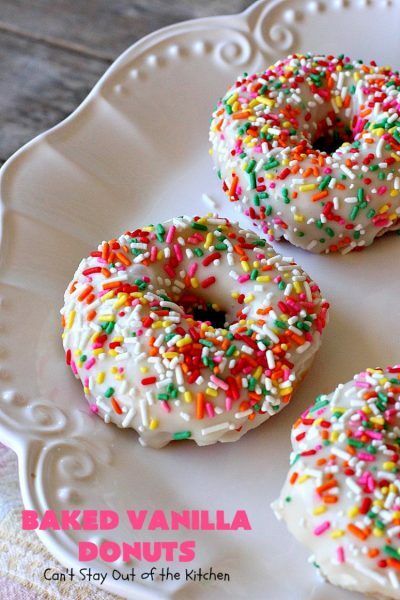 Sprinkle immediately with colored sprinkles after glazing the third time. 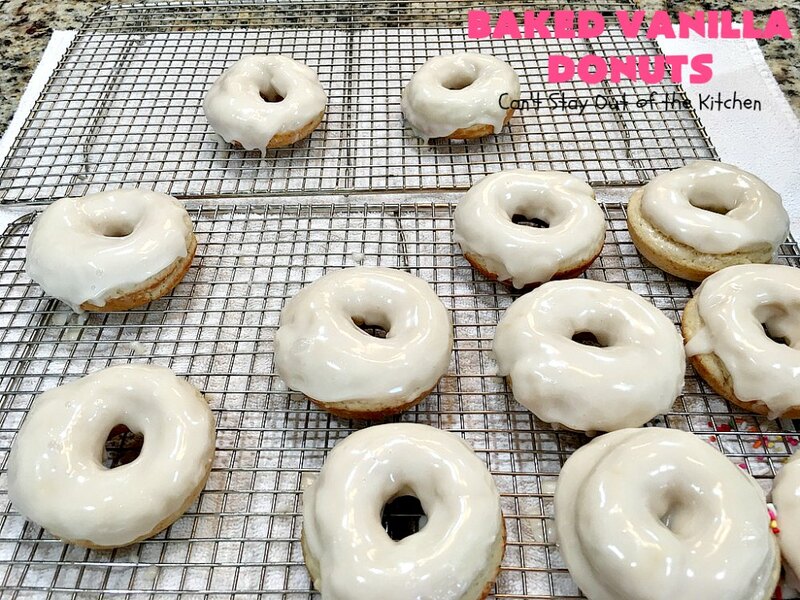 Are you hungering for some Baked Vanilla Donuts yet? 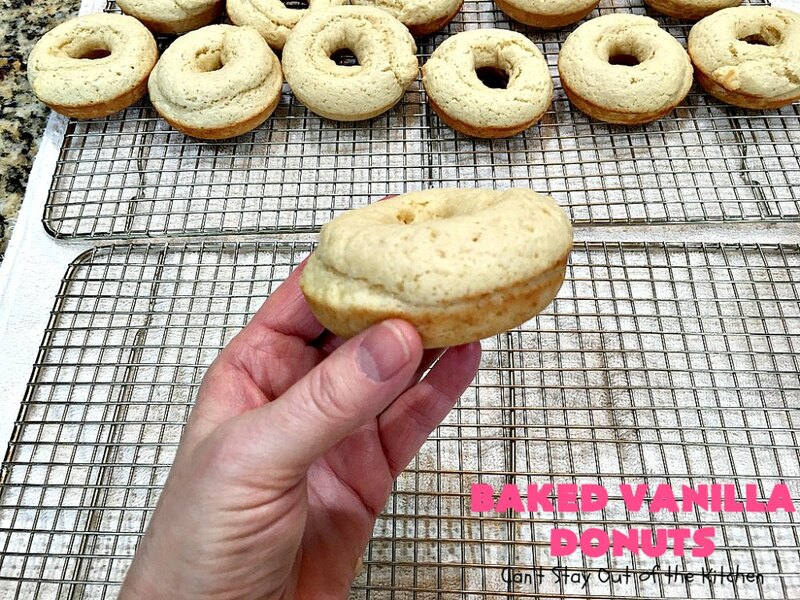 Baked Vanilla Donuts will surely satisfy any sweet tooth craving. 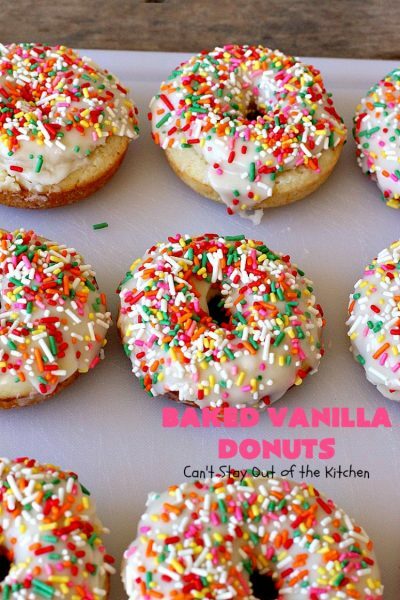 If you enjoy donuts, you’ll love these. 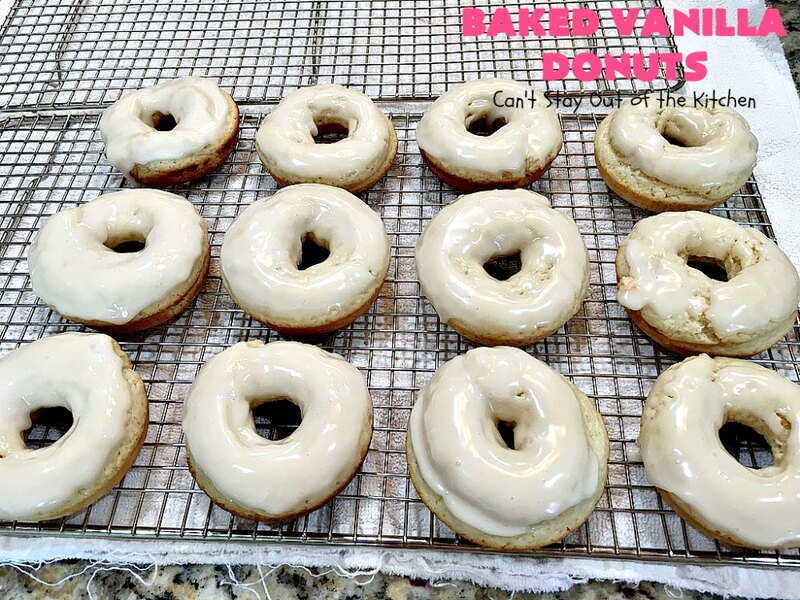 Homemade donuts never tasted as dreamy as these delectable Baked Vanilla Donuts. Yum.